Peppermint Stomach Soother - Organic Peppermint tea is the perfect way to lift your spirits and quiet your stomach; with a fresh flavor and aroma you'll want to enjoy everyday. The use of this refreshing leaf has been handed down from the ancient Greeks and Romans, who soothed their digestion after feast days with a sprig of mint. * Today you can enjoy the invigorating taste of Organic Peppermint (Mentha piperita) to ease minor stomach discomfort and relieve gas and occasional heartburn. It is also known to stimulate appetite, ease travel and morning sickness, and soothe common PMS cramps. The German Commission E (1998) and Bartram's Encyclopedia of Herbal Medicine (1995) cite Peppermint as effective for relief of minor spastic complaints of the gastrointestinal tract, as well as simple indigestion. We use the finest organic peppermint leaves grown in Oregon and Washington, where the right combination of weather and soil augments the essential oil content of the leaves, boosting the taste of the tea. Pour one cup of boiling water over tea bag, steep 6 t0 8 minutes. For stronger flavor, steep longer. For best results, during 2 to 3 cups per day, as needed. 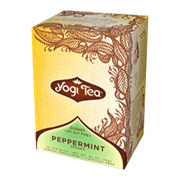 Peppermint Tea - is shipped in a discrete, unmarked package. Orders are processed immediately and usually take about 3 to 5 working days to be received. We do ask that you try it for 2 to 3 weeks to feel the full effects. Any information received is used only for order processing and shipping purposes. Your information, such as e-mail address, will never be disclosed to a third party.